On average, more than ten people die each year because of dangerous currents in the Great Lakes. While residents are encouraged to visit and enjoy Michigan beaches, the Michigan Department of Health and Human Services is urging everyone to learn about safe swimming and the signs of dangerous currents. Dangerous currents develop when winds blow toward the shore, and waves are moderate to high (3 feet or higher). The Great Lakes produce structural currents, rip currents, outlet currents, longshore currents, and channel currents—all of which can cause serious danger to swimmers. The eastern shore of Lake Michigan has the most current-related incidents of all the Great Lakes, and out of the 514 current-related incidents (rescues and drownings) that occurred on the Great Lakes from 2002-2016, more than 71 percent were on Lake Michigan. The good news for beachgoers is that currents and high wave activity can be forecasted, and with the right information, you can help have a safe and enjoyable time in natural waters. Everyone is encouraged to learn to swim and how to be safe in and around the water. Watch for dangerous waves and signs of rip currents (water that is discolored and choppy, foamy, or filled with debris and moving in a channel away from shore). It is never safe to swim near a structure such as a pier or break wall. Never go swimming alone, and designate someone to watch people who are in the water. Follow beach hazard statements and avoid the water when conditions are not safe for swimming. While it is important to avoid currents altogether, it is equally important to know how to survive one. 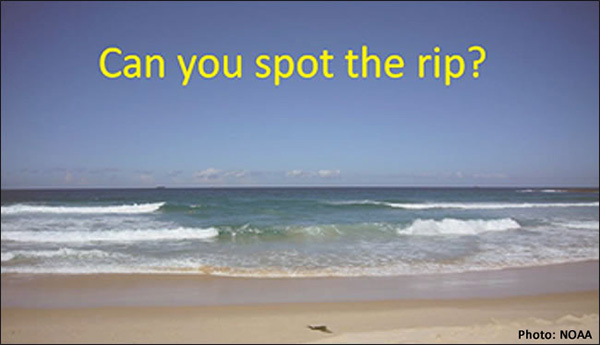 If you find yourself in a rip current, flip on your back, float to conserve energy, and follow the safest path out of the water – which could be along the line of the current until it is less strong, or along the shoreline. 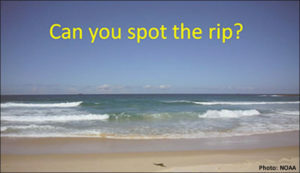 To learn more about drowning risks in natural water settings, visit https://www.cdc.gov/features/dsdrowningrisks/ or the national weather service site at http://www.ripcurrents.noaa.gov/ for information about rip currents.